Reactions have continued to trail President Muhammadu Buhariâ€™s planned visit to Lagos state on Saturday for 2019 presidential campaign. 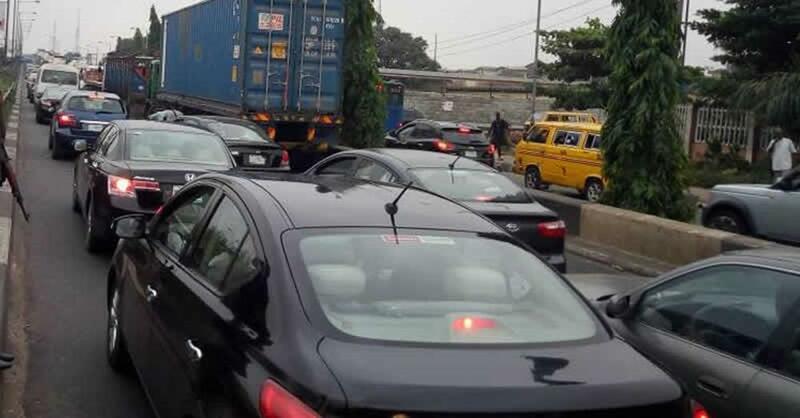 Governor of Lagos state, Akinwunmi Ambode on Thursday stirred reactions online as trailers regularly positioned at Eko bridge were removed ahead of the presidentâ€™s visit. Also, 18 roads were announced to be closed on Saturday. This did not go down well with some Lagosians on social media who have lamented the alleged â€˜insensitivityâ€™ of the Lagos government to the plights of citizens because of Buhariâ€™s visits. The All Progressives Congress, APC, presidential campaign would hold on Saturday, Feb. 9th at the Teslim Balogun stadium in Surulere. @Puremind_ â€ Driving through Eko bridge down to Alaka through to Stadium and there is no sight of trailers, tankers and containers. Buhari is coming to Lagos all of a sudden there is no tanker on Lagos roads? So there is actually a solution?